Capt. Prapat Chutkhao, director of operations and information at the Sattahip Naval Base, and Capt. 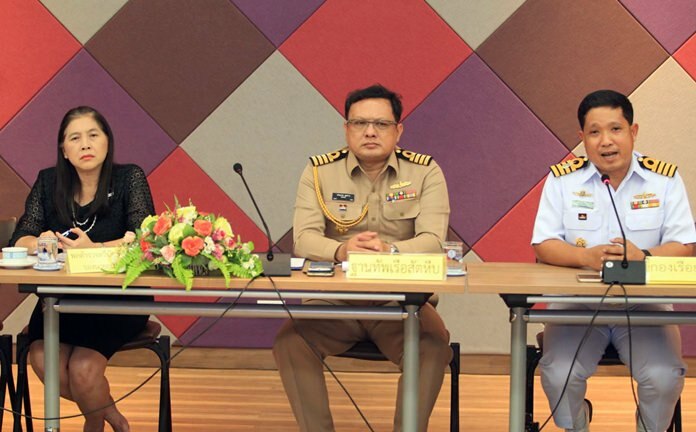 Sinsamut Panja, operations director for the Battle Squadron, met with police, army, Pattaya City Hall and Marine Department officials to mull security plans for November’s international fleet show. The navy has proposed closing Bali Hai Pier every morning during November’s international fleet show, which would cripple transportation to Koh Larn and leave scuba diving companies high and dry. The suggestion to close the South Pattaya jetty from 6 a.m. though noon Nov. 13-22 came at a meeting called by the military to begin mapping out security plans for the fleet show, which will see navies from 40 countries participating. The suggestion also was made to close roads to the pier after 3 p.m.
No decision was made on the proposal, nor any other topic discussed at the meeting, with attendees agreeing only they needed to hold yet more meetings. If implemented, however, the closure would impose a tremendous hardship on dive companies, Koh Larn ferry operators, speedboat vendors, fishing charters and tour boats, who all load passengers in the morning. Most of those boats are too large to reach the beach, thus giving them little option but to lose 10 days of income. Capt. Prapat Chutkhao, director of operations and information at the Sattahip Naval Base, and Capt. Sinsamut Panja, operations director for the Battle Squadron, met with police, army, Pattaya City Hall and Marine Department officials to mull security plans. Also discussed were staffing, traffic, medical support, fire services, marine rescue, parking and closed-circuit television monitoring. The security worries come from the fact that Prime Minister Prayut Chan-o-Cha is expected to attend one or more days of the fleet show, as well as senior military officers from 40 countries.